Over five years ago, a grassroots organization formed with one initial goal in mind — find a way to keep people from using the emergency room of the local hospital to get basic health care. They got together with local physicians, specialists, nurses and practitioners and created a referral network to assist those who were at or below the poverty line. However, in the last year, they came to realize they could do so much more. Surveys of the local populace showed there was a large segment of the population that had jobs, families and homes, but did not have adequate health insurance coverage — in some cases, no coverage! These families were getting by as best as they could, given the poor economy, plummeting home values and skyrocketing deductibles. Now, with larger sections of the Affordable Care Act getting closer to being put into effect, many full-time employees are finding their hours reduced to 30 or less to keep the penalties from being assessed to the business. Finding themselves relegated to part-time status, chances are, access to pay into a healthcare plan has all but disappeared for these hard working people. Thus, the board of directors immediately went to work on revamping the mission of Bartow Health Access. Instead of being a referral network, why not be a state-of-the-art medical facility that can cater to the health care of the local populace on a sliding fee basis? They hired a new executive director, began revising their mission guidelines and hired a full-time physician and a nurse practitioner. They are working on revising their status with the state and looking for federal grant dollars to help support this mission. Coinciding with all of the changes in the last several months, it became readily apparent to the new executive director and member of the board that the current website fell far short of what was needed to represent the organization. We at AJS Productions rushed at the chance to put a proposal together. With our background in helping establish professional website designs for other non-profits, we felt we understood how to best represent the needs of Bartow Health Access. And, we are happy to say, they felt the same about us. It took months of back and forth discussions and work to fine-tune the site, but, in the end, we feel it was well worth it. We encourage you to visit the site and, more importantly, share it’s mission with your friends and family. 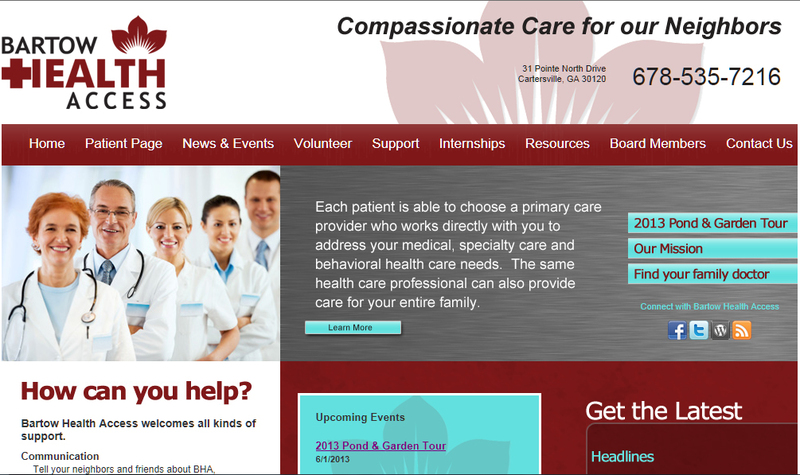 We made sure to fully integrate their site with social media to aid in spreading the word. Whether you use Twitter, Facebook, are a blogger or choose to mark you favorite websites in your browser, there is always a way to keep tabs on Bartow Health Access. Bartow Health Access — your new home for health care.